Magnetic stripes around mid-ocean ridges reveal the history of Earth's magnetic field for millions of years. 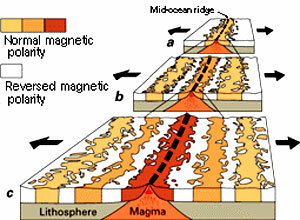 The study of Earth's past magnetism is called paleomagnetism. “Reversals take a few thousand years to complete, and during that time--contrary to popular belief--the magnetic field does not vanish. "It just gets more complicated," says Glatzmaier. Above: Supercomputer models of Earth's magnetic field. 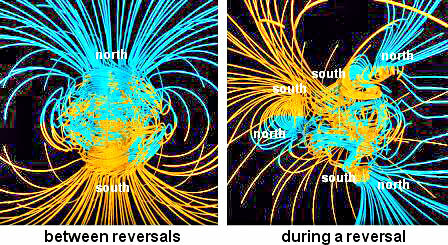 On the left is a normal dipolar magnetic field, typical of the long years between polarity reversals. On the right is the sort of complicated magnetic field Earth has during the upheaval of a reversal. In November 2003, PBS television presented a special on magnetic storms on its program NOVA. This programmed focused on the declining state of earth’s magnetic field, the coming magnetic pole shift, and its potential impact on life on earth. The Earth's magnetic field has been our protector for millennia, and now, it appears, it's about to go away. The Earth's magnet field is getting weaker rapidly. We cannot guarantee that the magnetic field of the Earth is still going to be there a thousand years from today. The question is not if that's going to happen, it's when that's going to happen. NARRATOR: No one has ever experienced a magnetic reversal. If this is really the beginning of a flip, what exactly will happen next? One man who may know, is geologist Rob Coe. For 25 years, he's been coming to Steens Mountain in Oregon, a vast heap of hundreds of ancient lava flows. Sixteen million years ago there was a huge series of eruptions here. You can pick out literally hundreds of lava flows over on that wall. Each line delineates a different lava flow. It's over 3,000 feet of overlying flows. What we found as it started to reverse was the strength of the Earth's field decreased dramatically, by 80 or 90 percent. But it couldn't hold that polarity, and it fell back to... reversed and the intensity crashed again. And what we found was even harder to believe. The quickly chilled margins in the bottom and the top had one direction, like that of the underlying flow, and the middle portion had a direction that was sixty degrees farther away. It was just as though, while the flow cooled, the field had moved sixty degrees, which if you calculate it out, that comes to about six degrees of movement per day. If we were observing this with a compass, you would be able almost to see the motion with your eye. It was truly astonishing and extraordinary. Patrick Geryl has written a book, The Orion Prophecy, in which he claims that his research of ancient Mayan and Egyptian codes has enabled him to determine precise dates in history when previous cataclysms have occurred and gave him the key to predicting the next cataclysmic event which centers on the now famous date of the winter solstice of 2012. Has misinterpreted the codes and is he crying out like Chicken Little saying that the sky is falling? If so, then we have little to worry about and sleep peacefully every night until then. 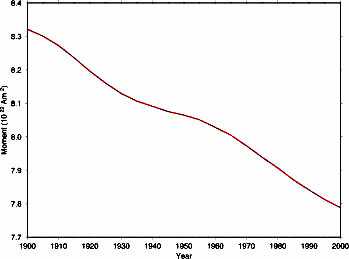 I have shown this in my essay Cosmic Time Cycles and it is an important clue to the periodic catastrophes that have occurred to our solar system in the past and makes it possible to predict future events as the critical points of our solar galactic orbit are the points where we cross the galactic plane. I have also pointed out the indication that the precession motion of the earth also points to lesser cataclysms where we might be reversing our precessing motion every cycle which indicates changes in the earth’s rotation. Measurements have been made of the Earth's magnetic field more or less continuously since about 1840. Some measurements even go back to the 1500s, for example at Greenwich in London. If we look at the trend in the strength of the magnetic field over this time (for example the so-called 'dipole moment' shown in the graph below) we can see a downward trend. Indeed projecting this forward in time would suggest zero dipole moment in about 1500-1600 years time. This is one reason why some people believe the field may be in the early stages of a reversal. We also know from studies of the magnetization of minerals in ancient clay pots that the Earth's magnetic field was approximately twice as strong in Roman times as it is now.